OAK RIDGE, Tenn., April 13, 2018 – A team led by researchers at the Department of Energy’s Oak Ridge National Laboratory has developed a safer cladding for nuclear fuel rods. The new material, an alloy of iron, chromium and aluminum, avoids zirconium. As a result, it should give plant operators substantially more time to react to incidents such as a station blackout. The fuel rods at civilian nuclear power plants have been sheathed with an evolving zirconium alloy for the past six decades. Zirconium as the preferred base metal was chosen in the 1950s by Hyman Rickover, then a captain and later an admiral, as he worked to take nuclear technology and use it to power ships and submarines. His choice of cladding, as well as the light-water reactors that powered these vessels, was adapted by the nuclear power industry and dominates plants throughout the world. Zirconium absorbs very few of the neutrons that drive a nuclear reactor, so zirconium alloys made sense as a fuel cladding—as long as the reactor operated as planned. If a reactor loses its cooling water, however, the zirconium can make a bad problem worse. 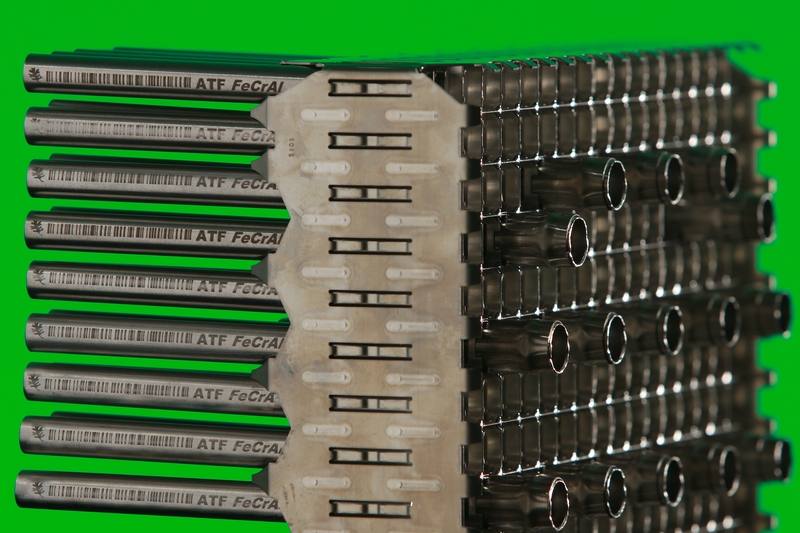 The job for Terrani’s team, as the innovation engine of the consortium led by General Electric, was to create a zirconium-free alloy that would generate as little hydrogen as possible during incidents while at the same time matching the performance of the nuclear fuel rod cladding that is in use today. The project was out of the ordinary for at least three reasons, Terrani explained. In the first place, the team was not interested in testing existing alloys to see if one might be appropriate. Instead, it designed the new alloy from scratch with a diverse team that included experts in nuclear engineering, materials science, radiation effects, corrosion, thermomechanics and alloy fabrication. The approach made use of the wide range of tools and expertise available at ORNL, DOE’s biggest science and energy laboratory. The new cladding also underwent testing at ORNL’s High Flux Isotope Reactor and Idaho National Laboratory’s Advanced Test Reactor, as well as the Halden research reactor in Norway. Secondly, the team was able to identify and produce the alloy in six years, which is lightning fast in the nuclear industry. Conventional wisdom says the project should have taken twice the time, Terrani said. Thirdly, he added, the project is unusual because the research and development is complete. It has now been turned over to the industry for testing and evaluation. The new cladding was placed in a reactor at Southern Nuclear’s Hatch Nuclear Power Plant in Georgia for testing in February, Terrani said, and subsequent installations are planned. Key collaborators on the project include Yukinori Yamamoto of ORNL’s Alloy Behavior and Design Group, Kevin Field of the lab’s Radiation Effects and Microstructural Analysis Team, and Bruce Pint, leader of the lab’s Corrosion Science and Technology Group. This research was funded by DOE’s Office of Nuclear Energy and leveraged ORNL’s High Flux Isotope Reactor, a DOE Office of Science User Facility.